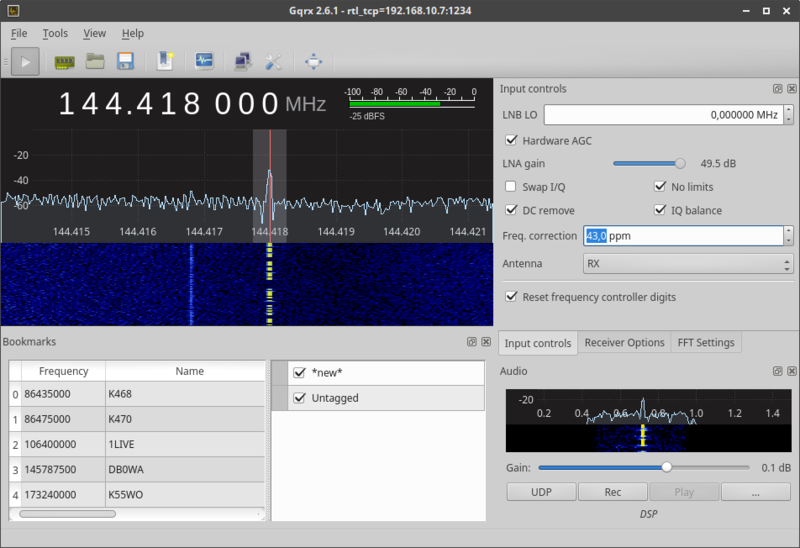 you've installed install gqrx on your local computer. Now you've come to a point where you want to know how well your station is performing. The first step is to determine your frequency offset. 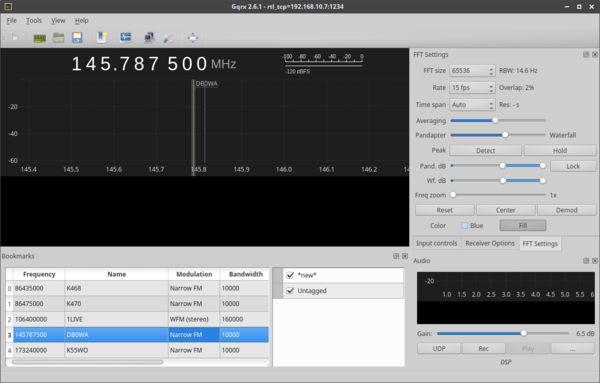 As a more comfortable way to get the ppm of your SDR the tool kal from https://github.com/viraptor/kalibrate-rtl can be used. At the moment you probably have to get and build it by yourself. 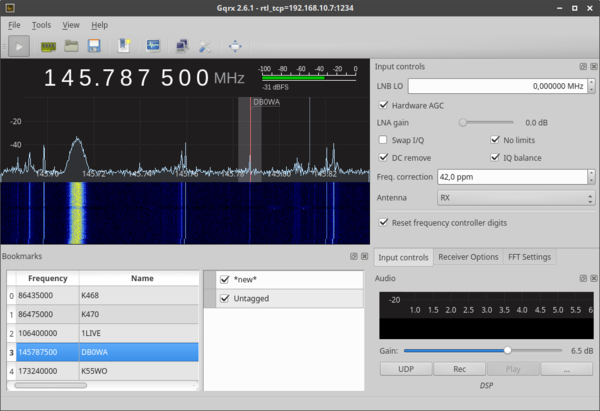 kal: Scanning for GSM-900 base stations. kal: Calculating clock frequency offset. Now enter the measured ppm in satnogs-setup and you're done. The value should be entered without decimals, for example -1. To start, please connect to your Raspberry Pi's local web interface. By default the URL is something like "http://192.168.0.5:5000"; you'll need to figure out what it is for your client. In the upper right corner there is a big green button where you can set your ground station in standalone mode. Do not forget to set this back to network mode when done with your adjustments! 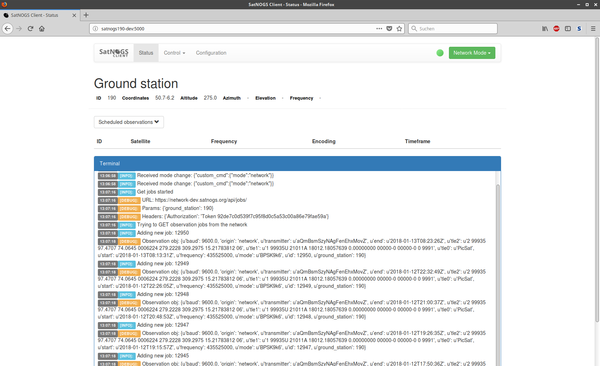 While your station is in standalone mode, no observations from the SatNOGS network will be executed! 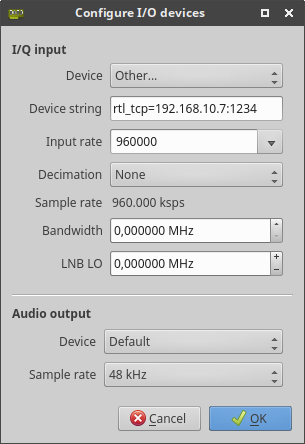 Use the device argument 'rtl_tcp=0.0.0.0:1234' in OsmoSDR (gr-osmosdr) source to receive samples in GRC and control rtl_tcp parameters (frequency, gain, ...). No further output will be generated until you connect to this server. Hitting C-c will stop it and the command line appears. You will have to stop this server if you want to go back to network mode - do not forget about this! You will have to go to the setup menu, either by clicking on the "harde" symbol, or navigating through the menu item called "File -> I/O Devices"
"Audio Output -> Device" and "-> Sample rate" should be set by default, values on average soundcards would be something like "Default, 48 kHz" Close the dialogue by clicking "OK" Your RTL-SDR spectrum server on the Pi should now show up a connection from your computer running gqrx. The only thing left now is to "Start DSP" - from the menu item "File", by hitting C-d or simply clicking the Play-Button. Now got to the tab called "Input controls" and find an input field called "Freq. correction". By default this should show "0,0 ppm". Set frequency back to your beacons transmit frequency. After this you have to increase the Freq. correction value as long until you can hear the beacon. Now zoom into the panorama by locating your mouse pointer in the range where the frequency values are printed below the panorama, just above the waterfall. Try to fit the Freq. correction value as good as possible, that your receivers red indication line is just in the middle of the transmitters bandwidth. 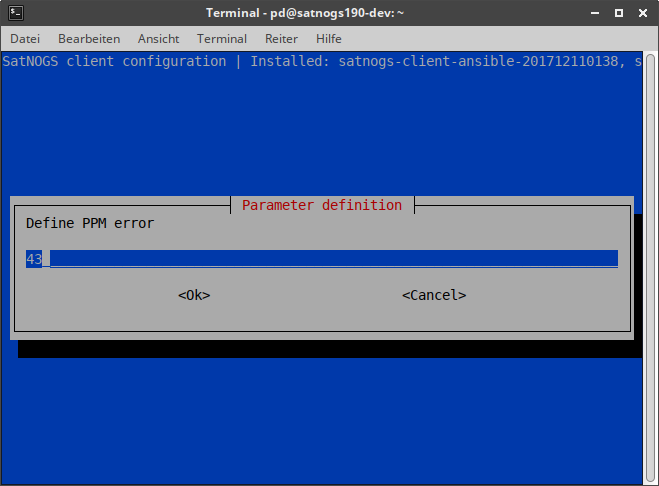 Navigate to "Advanced -> SATNOGS_PPM_ERROR" and enter the new value. Exit the satnogs-setup with "Back", then "Apply Configuration" (this might take a while) and "Back". You are done with frequency offset correction. With gqrx, you get a nice tool to do some SDR stuff by the way. Just play around a bit and get familiar with all that stuff. Just keep in mind that, as long as you run the RTL SDR Spectrum server or you have set your client into standalone mode, nothing is done from network. To get some nicer waterfalls one has to dig into waterfall plotting script. This is a static one and, so far, cannot be configured through satnogs-setup. Anyway: there is no magic behind it and one can understand what the changes are once you have seen them. Save the file and you are done. Schedule some observations and watch the new colors. Maybe you can just improve it a little more but keep in mind: always keep a bit of the noise floor into the waterfalls, so you can see the whole signals dynamic range. I love it, when there are only a few dots of the noise. This page was last edited on 8 November 2018, at 17:58.